Ideally located in Portarlington, within walking distance to the main street shops, supermarket and hotel, and just a short drive to Portarlington Golf Club, these cabins are great for golfing groups on a budget. 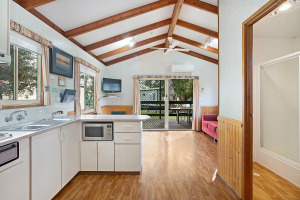 Portarlington Holiday Park offers a range of Standard, Park and Deluxe cabins all self-contained with 2 bedrooms with separate living and dining area as well as access to beach front just 100m from the cabins. Bedding configurations vary.